As one of the first parts of Canada to be explored and settled by Europeans over four centuries ago, Quebec has played a dynamic and fascinating role in the history of North America. 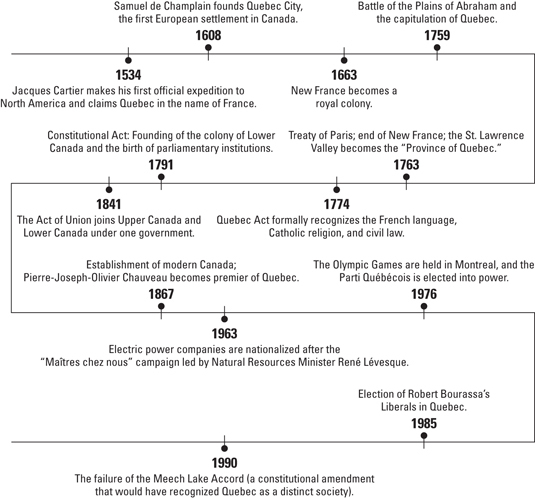 This handy Cheat Sheet introduces you to some of the key things you should know about Quebec, from its original First Nation inhabitants and its world-famous historical landmarks, to a helpful timeline of the most significant events that have shaped the rich history of Canada’s largest province. The Plains of Abraham: At the time of the French regime, these plains were located outside Quebec and were used as pastureland for livestock. They were named in honor of Abraham Martin dit l’Écossais (“called the Scot”), who arrived in New France in 1619. He was one of the first settlers in the colony and the first pilote du roi (royal pilot) to navigate the St. Lawrence River. It was on the heights of the Plains of Abraham that the French and British armies squared off against each other for possession of Quebec on September 13, 1759. Today, these plains form the gathering place where Quebec City dwellers converge to celebrate Saint Jean-Baptiste Day every June 24. It’s a beautiful green space in the heart of an active, dynamic city. Mount Royal: Located in the heart of Montreal Island, Mount Royal is a small hill with three peaks. Contrary to popular belief, Mount Royal was never an active volcano. When Montreal was first industrialized, Mount Royal became a focal area of urban development. The city’s rapid growth encouraged municipal authorities to protect Mount Royal as a green space. The city bought some of the land and hired Frederick Law Olmsted (1822–1903) to design a park. Olmsted was a leading landscape architect who designed Central Park in New York City. On May 24, 1876, Mount Royal Park was opened to the general public. From 1885 to 1918, people could go to the top by cable car. In 1938, a large artificial pond called Beaver Lake was completed. Thanks to its green spaces and hiking trails, Mount Royal Park became a peaceful haven for Montrealers from all parts of the city. Île d’Orléans: Île d’Orléans is located on the St. Lawrence River, just east of Quebec City and Lévis, where the river’s two banks come closest to each other. This island has six municipalities and is one of the oldest areas of settlement in Quebec. More than 300 of Quebec’s old families have ancestors native to Île d’Orléans. The first land was granted in 1636, and five parishes were established between 1669 and 1679. The Quebec Citadel: The Quebec Citadel was part of the fortifications of the Quebec capital. Perched on Quebec City’s heights, and long nicknamed the “Gibraltar of America,” the Citadel ensured control of navigation on the St. Lawrence River and defended the colony against invaders. Some of its buildings date back to New France, but it was under British rule that it was fully completed in the early 1830s. The work of Lieutenant Colonel Elias Walker Durnford, the Citadel was designed by French engineer Sébastien Vauban. Quebec has not been attacked since the winter of 1775–1776, so the Citadel was primarily used to garrison British troops stationed in Quebec. It was later home to the Royal Regiment of Canadian Artillery and, since 1920, to the only French-speaking regiment in the Canadian Forces, the 22nd Regiment, founded at the beginning of World War I. During World War II, the Citadel hosted the deliberations of the two Quebec conferences that brought together British Prime Minister Winston Churchill and U.S. President Franklin Delano Roosevelt. The Citadel has also been the summer residence of the Governor General of Canada since the 19th century.